Back in 1984, Dr. Robert B. Cialdini wrote a book called “Influence: The Psychology of Persuasion.” Since then, it’s been widely hailed as a seminal book on marketing, something everyone who is doing conversion optimization should read. The most significant aspect of this tome was highlighting Cialdini’s 6 Principles of Influence, which are reciprocity, commitment/consistency, social proof, authority, liking and scarcity. In the almost three decades since the book’s publication, its six principles have been adapted to Internet marketing, too, especially the business of conversion rates. This makes all the sense in the world when you think about it because conversions are all about persuasions. The next time a browser merely visits your website, you want to turn him into a shopper and then a definite buyer. In the world of conversions, every little bit of persuasion counts. 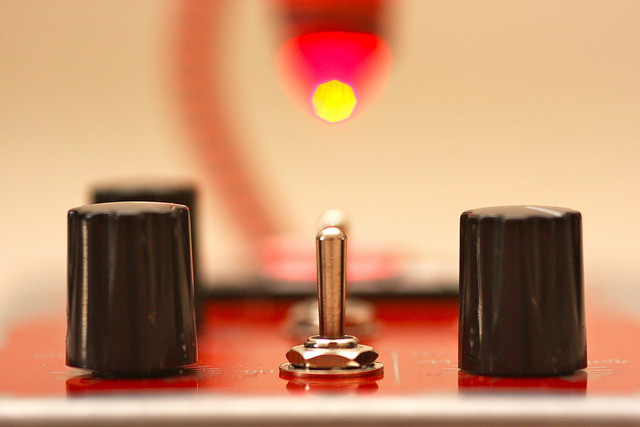 Here’s how you can use Cialdini’s 6 Principles of Persuasion to boost conversions. Cialdini’s first principle of persuasion states that we human beings are wired to basically want to return favors and pay back our debts. In short… to treat others as they’ve treated us. Let’s say that you’re running a popular blog that offers its readers highly actionable and practical information that makes their lives better. Of course, all of this information is offered for free; they just have to visit your site and absorb all of the details. Based on the idea of reciprocity, your site visitors would be more likely to feel obligated to buy something from your website, providing you with an eventual conversion. One of the best examples of this Cialdini principle in action is the Quick Sprout website by Neil Patel. Neil’s been very successful in business, having already founded two Internet companies, KISSmetrics and Crazy Egg. His website is centered around his blog, which is single-mindedly focused on giving its readers tips, advice and suggestions on how they can be more lucrative marketers. Neil’s business is that he sells his website-traffic consulting services and Quick Sprout Traffic System Pro, which is designed to drive more traffic to your retail website. Thanks to his very informative blog that churns out nothing but tips on making people money, regular site visitors are likelier to become actual customers of his. The principle of commitment (and consistency, too) declares that we human beings have a deep need to be seen as consistent. As such, once we have publicly committed to something or someone, then we are so much more likely to go through and deliver on that commitment…hence consistency. This can be explained, from a psychological perspective, by the fact that people have established that commitment as being in line with their self-image. 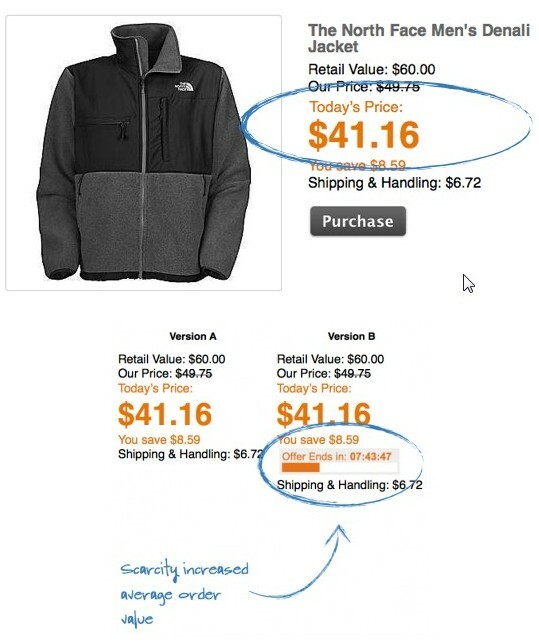 Marketers have figured out how to use this second Cialdini principle in their efforts to obtain greater conversion rates. Marketers can rely on getting site visitors to commit to something relatively small and usually free-of-charge, such as a sample guide or a whitepaper that they can gain access to from the marketers’ websites. This increases the likelihood that those site visitors will eventually see themselves as customers, which allows marketers to follow up with an offer to buy their products or join their services. A striking and memorable example of this Cialdini principle in action can be found on the Copyblogger website. Copyblogger is the brainchild of Brian Clark. While it’s also a popular blog, it’s really a software and training organization that sells content marketing software through Copyblogger Media. 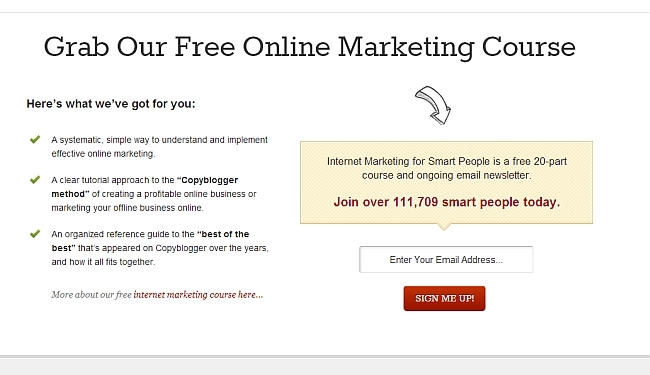 On the Copyblogger homepage, if you scroll down a little bit, you’ll notice the big headline urging you to grab the company’s free online marketing course. All you’ve got to do is sign up by entering your email address. Clearly, this is a form of public commitment meant to get you to see yourself as a customer of the company. It’ll raise the chances that you’ll potentially go on to purchase one of their services, such as Scribe or Synthesis. Cialdini defined social proof as people doing what they observe other people doing. It’s a principle that’s based upon the idea of safety in numbers. For instance, if our coworkers are working late, then we’re likelier to do the same; if we note that a particular eatery is always full of people, we’re likelier to give that establishment a try. We’re even more influenced by this principle when we’re unsure of ourselves or if the people we observe seem to be similar to us! The field of social psychology is rife with experiments that beautifully illustrate this unavoidable, human phenomenon, but one of the most classic ones has to be the 1960s elevator experiment. Basically, whatever the majority of people in an elevator does, an individual who joins this group inside of the elevator will copy. For example, if the group looks to the back of the elevator, the individual will copy it and do the same, even if it looks funny! Note how the vast majority of people just refuse to think or behave independently! You can harness this power of social proof to drastically increase the conversion rates of your website because there are several ways to incorporate it, but one of the most powerful is through so-called “wisdom-of-the-crowds” social proof. 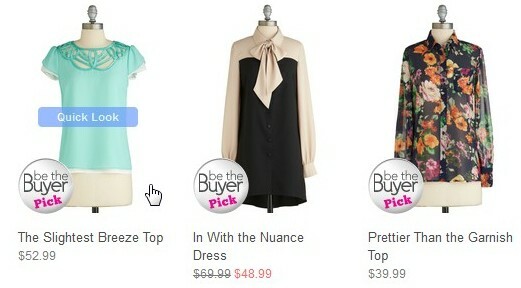 Take clothing e-tailer Modcloth. This website is very big on community, and, as such, it empowers its shoppers to vote on what specific styles they believe the website ought to sell in the future. Such styles are awarded the “Be The Buyer” badge. The shoppers are heavily influenced by the Modcloth community, as evidenced in the fact that styles with said badge sell at double the rate of styles with no badge. 4. Authority: You Will Obey Me! Ever wonder why people in general have a tendency to obey figures of authority, even if those figures of authority are objectionable and ask others to commit objectionable acts? It’s simply the essential nature of the human animal! Accessories such as job titles (Dr., for instance) and uniforms can infuse this air of authority into people, thus leading the average person to accept what a person in authority says without question. You can see this in commercials that, for example, utilize doctors to front their ad campaigns. The use of this principle can be seen in the case of ShoeDazzle, which is a startup Internet retailer that specializes in women’s shoes and accessories. Founded in 2009, the company was co-founded by personality Kim Kardashian, who also serves as one of ShoeDazzle’s chief fashion stylists. Even though this company was also founded by serial entrepreneur Brian S. Lee and O.J. Simpson attorney Robert Shapiro, that didn’t help ShoeDazzle attract conversions in the form of shoppers who became actual buyers on the website. How could it? To the target demographic of the startup—young women who are obsessed with shoes—Lee and Shapiro are no authority figures! That’s why the company brought in Kardashian as a co-founder. Whatever your personal feelings about her fame, she’s seen as an authority figure among young women shoppers because she’s always wearing the latest shoe styles and being photographed in them. Her endorsement of this startup is a great example of authority in action. What is it to like someone? According to Cialdini, it’s extremely meaningful because it will affect the chances of you being influenced by that individual. Welcome to Cialdini principle number five: liking. Liking is based on sharing something similar with people you like, and it’s also based on something as superficial as how attractive a person’s looks are! This principle can be applied to conversions in the following way: A company that wants to boost its conversion rates simply has to focus on creating a very well-executed “About Us” page. That almost sounds absurd, but it makes all the sense in the world when you understand that a company’s “About Us” page serves as an opportunity to tell potential buyers all about the similarities between its people and site visitors. Since similarity is one of the key building blocks of liking, you now see why investing time in an effective “About Us” page is so vital. To flesh this out more, let’s take a look at a case study. 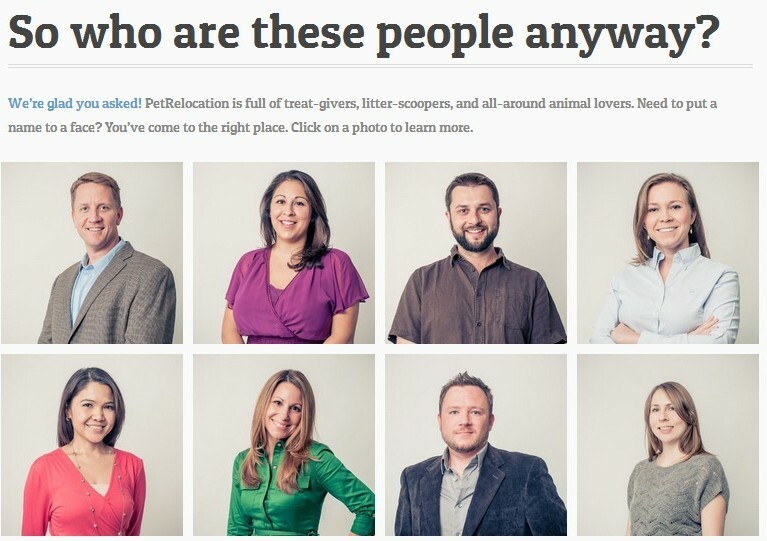 This Forbes case study centers on a little company called PetRelocation.com. This company aids pet owners from all over the world in moving their pets from country to country. The company’s “About Us” page is chock full of bios of its staff, where every bio emphasizes not only the staff’s love of dogs, but also humanizing qualities of managers and employees, such as hobbies they enjoy. As a result, this humanizes the entire company and consequently increases its likeability, which in turn boosts the conversion rate of site visitors. In a much broader sense, businesses that are extremely successful experience this liking principle on a grand scale. Richard Branson’s Virgin Group is liked by millions of loyal consumers who enjoy its mobile phone service (Virgin Mobile) and its airlines (Virgin America), among other businesses. 6. Scarcity: When You Believe Something Is in Short Supply…You Want It More! Here we are, at the end of Cialdini’s authoritative list of persuasion principles. Scarcity is defined as the perception of products seeming to become more attractive when their perceived availability is rather limited. For instance, human behavior is such that we are likelier to purchase something if we’re informed that it’s the very last one or that a special deal will soon expire. In short, people really believe that they’ll be missing out on something they have to have if they fail to act quickly! Scarcity is one of the most popular Cialdini principles that various companies use over and over again in order to boost conversions and earn more money from people. Just take a look at this screen grab of Orbitz.com and its attempt to sell airline tickets with a greater sense of urgency. By incorporating the line “Act fast! Only 2 tickets left at this price!” Orbitz.com is very blatantly telling its shoppers that the supplies of these airline tickets won’t last for very long. As such, this is a picture-perfect example of the scarcity principle being utilized in order to boost conversions for this webpage. Finally, never use fake scarcity because your site visitors will see right through you! Fake scarcity is when a site claims that supplies are limited or that a price won’t last for long, but it’s flagrantly obvious that it’s not true. These 6 Principles of Influence or Persuasion have been used for decades by businesses and marketers, all to get you, the consumer, to part with your hard-earned money. Since the explosion of e commerce on the Internet, Cialdinis’ six principles have naturally been adopted there, too. The name of the game in the business world is persuasion, and you can make this work for you! The goal of any business is always to make money, so pay close attention to these principles, learn what they’re all about, and apply them to your own landing pages. If you apply them properly, you’ll notice an unmistakable boost in your conversions over time. Don’t be afraid to give your potential customers a free sample or two, and definitely tell them how your products won’t be available for much longer at certain prices if they don’t act fast. 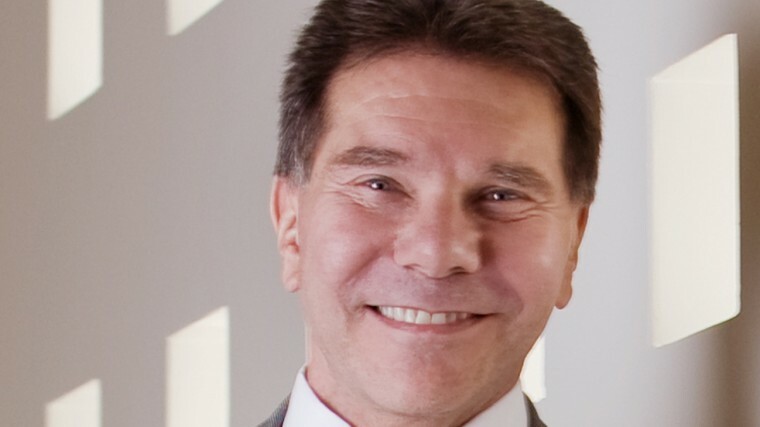 Update: Cialdini has since published his 7th principle: Unity. Hi, I'm Marc, a happenin' freelance writer, blogger and editor. Connect with me through my various social media accounts and check me out on my website! If you change a paragraph or two, this post could just as easily be about dating. Excellent info. Great post Peep! I really enjoyed the article. An undeniable example of social proof is the success of Facebook. The entire user experience and massive growth is heavily based upon the principle of social proof. Even their new “Facebook Sponsored Stories” feature. The stories are only shared with friends you know and it appears at the top of all your friends feeds. When friends see the recommendation coming from another friend they are more likely to read it, comment, and share it. This is social proof in action! Thnx again, keep it coming! This is my first time on your site — joined your email list as well. Fantastic extrapolation of Cialdini’s marketing classic. Amazing posts peep,just like always. 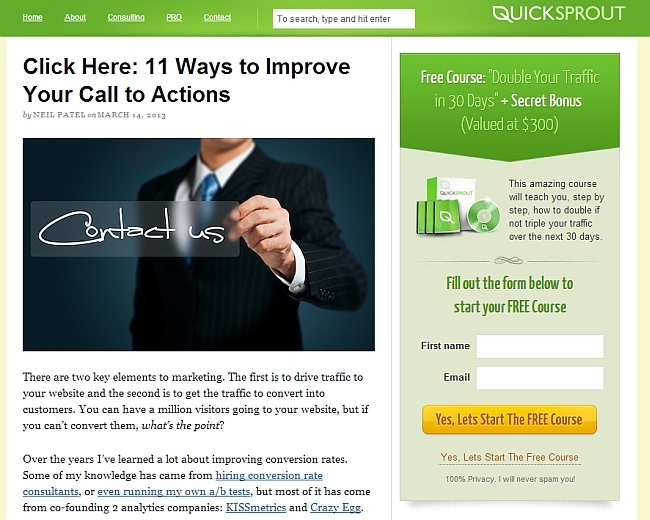 There is a lot to say about how to apply these principles to increase conversions. We know from neuroscience that whenever we are faced with a new situation/event or meeting someone for the first time our reptilian brain is alarmed to evaluate whether its a threatening event/person or friendly (in our case, landing on a new website). By quickly building rapport and showing empathy (through our value proposition/headline, our lead paragraph) we can open a window to start persuading the decision maker (the old brain) and start getting them to like us. It usually translates in low bounce rates on a page for new visitors. Looking forward for future posts peep. Good insight. Definitely if we like the person selling us something, it’ll lower our guard and we’ll be more receptive to the message. Great Post as always Peep, I think this is the only blog where I check back every other day to see if there is something new, as I believe you don’t send out emails for each post you write. 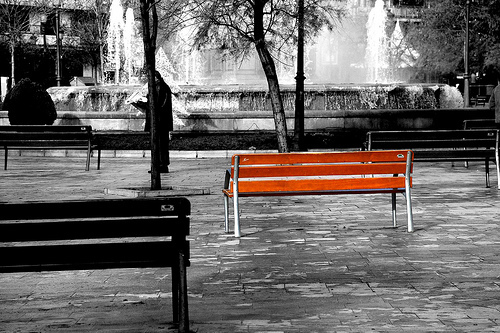 I get your email a week combining couple of posts and I find that different and a new approach to email marketing. I think social proof is most important, as it’s very comfortable to buy something you know other are buying. I think urban outfitters are doing an excellent job with this, they have a review tab with reviewers photos wearing the same product. Thanks! Indeed, I send newsletters only once a week. Good stuff. I love Cialdini. something great to learn here. These are called timeless business principles. They will always be effective. I will surely share this. I like the idea of RECIPROCITY. It only thought as not to be selfish marketers. For small businesses, one-person set-ups, or those without the authority/confidence yet in their sector – persuasion selling strategies online can be a daunting intangible – systems that are hard to set up and equally hard to measure. In that context, have you ever thought of releasing a step-by-step course of simple techniques businesses could use to increase their website conversions – especially now traffic is so precious with all the Google changes – just a thought? Good stuff as always and your book is excellent. Would love to see examples of how to use scarcity when you’re only selling one product, such as an eBook. Great post and thank you. Dear Peep Laja, thank you for your great article. We are proud publishers of Czech translation of Cialdini’s “Influence” book (http://melvil.cz/kniha-zbrane-vlivu) and would like to ask you for permission for translating and publishing your post in Czech language – on our blog. Is it possible? Thanks! What a fantastic article. I just recently came across Cialdini’s book at the library, read it, and was blown away. It really changed my thinking about many situations, including conversion rates. I actually wrote myself a “6 Principles” assessment where I judged my website based on these principles! I’ve also been a follower of your blog for the last few months, so this post really clicked for me. I think it’s worth going into any situation (selling, dating, job interview, friendly debate) keeping the six principles of persuasion in mind. I have seen positive results in my own interactions with people. Thanks for an excellent post! This guy have indirectly taught me more about marketing than I ever thought possible. If you want to get a serious education on the power of persuasion listen to his audio and buy his book YES! The case studies are unreal. All can be applied to your business for awesome results. GREAT post. Huge Cialdini fan.